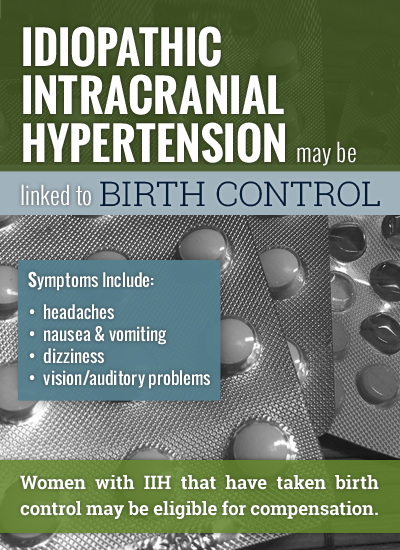 Research has established a potential connection between the use of hormonal birth control products like Mirena IUD, Yaz, and Yasmin, to an increased risk of a severe neurological disorder known as idiopathic intracranial hypertension. If you used Mirena IUD or another hormonal birth control pill or implant, and you have since suffered symptoms of idiopathic intracranial hypertension, like headaches, vision loss or permanent blindness, consult a knowledgeable lawyer as soon as possible to explore your compensation options. With a skilled product liability attorney on your side, you can protect your legal rights and seek fair and timely reimbursement for your losses. Many patients who were prescribed hormonal birth control have experienced idiopathic intracranial hy[ertension, also known as pseudotumor cerebri. Idiopathic intracranial hypertension (IIH), sometimes called pseudotumor cerebri (PTC) or benign intracranial hypertension (BIH), is a neurological disorder that occurs when there is an increase in the pressure of the cerebrospinal fluid inside the skull, without the presence of a tumor or other diseases. Cerebrospinal fluid is meant to protect the brain and spinal cord from injury, and the fluid is constantly produced in the brain and reabsorbed back into the bloodstream, allowing the pressure of the fluid around the brain to remain constant. However, when there is an increase in the pressure of the cerebrospinal fluid, the consequences can be devastating. Headaches occur in 92-94% of all cases of idiopathic intracranial hypertension, and the headache is typically worse in the morning and after any activity that further increases the pressure inside the skull. The term “idiopathic” means “of unknown etiology,” and this describes idiopathic intracranial hypertension perfectly, being that there is no obvious cause of the increased pressure on the brain, such as a tumor. In fact, the term “pseudotumor cerebri,” which is sometimes used to describe idiopathic intracranial hypertension, literally translates to “false brain tumor.” This means that IIH can only be diagnosed if there is no alternative explanation for the symptoms, and in most cases, the condition is believe to be related to the buildup or poor absorption of cerebrospinal fluid back into the bloodstream. A growing body of research has shown that the use of certain hormonal birth control pills and implants, like Bayer’s Mirena IUD (intrauterine device), may be linked to an increased risk of idiopathic intracranial hypertension or pseudotumor cerebri side effects. IIH can affect all age groups, but the neurological disorder is most common in women between the ages of 20 and 40, particularly those with obesity. In a study published in the New England Journal of Medicine in 1995, researchers found a link between IIH and the use of birth control products containing the hormone levonorgestrel, and a number of more recent studies have further explored this connection. Idiopathic intracranial hypertension is diagnosed with a brain scan to rule out other possible causes, and a lumbar puncture, which can also provide temporary relief from the symptoms of the condition. The increased pressure inside the skull characteristic of IIH leads to compression and traction of the cranial nerves, which supply the face and neck, and the nerve that supplies the muscle that pulls the eye outward. In some cases, if idiopathic intracranial hypertension is not treated properly or in a timely manner, the condition may lead to swelling of the optic disc in the eye (papilledema), which can result in permanent blindness. The main goal of treatment for idiopathic intracranial hypertension is to reduce the increased pressure on the brain and prevent significant vision loss or blindness. Some patients with IIH respond well to medication, while others require surgery to relieve the pressure on the brain. In some cases, the symptoms of idiopathic intracranial hypertension may resolve on their own (spontaneous remission) or with treatment, but may return months or even years later. It is currently not known what percentage of people with IIH will go into spontaneous remission, and what percentage with suffer chronic symptoms of the disease. Idiopathic intracranial hypertension occurs in approximately one out of 100,000 people, and can affect both children and adults. Unfortunately, as many as 10% of people who present with symptoms of IIH experience progressively worsening vision and may eventually suffer permanent blindness. If you have been diagnosed with idiopathic intracranial hypertension, and you believe Mirena IUD or another hormonal birth control product to be the cause, contact a reputable product liability lawyer today for legal help. You may have grounds to file a defective product lawsuit against the manufacturing company, in order to pursue financial compensation for your injuries and medical expenses.